The Main Street Program was developed by the National Trust for Historic Preservation in 1977.The National Trust developed its pioneering Main Street approach for commercial districtrevitalization, an innovative methodology that combines historic preservation with economicdevelopment to restore prosperity and vitality to downtowns and neighborhood business districts.The Main Street Approach consists of four components: Organization, Promotion, Design andEconomic Restructuring. These areas are integrated into a comprehensive revitalization strategythat is both incremental and long term. The first components rely on voluntary participation tobuild new confidence and involvement on the part of the merchants, downtown business andcommunity leaders. The last component is economic restructuring which uses market analysisand business retention, expansion and recruitment to bring new vitality to downtown. The Arizona Main Street Program was established by special legislation in 1986. The State programis managed in the Rural Development Office of the Arizona Department of Commerce. There isone Arizona Main Street State Coordinator on staff. Currently 15 of the 18 Arizona Main Streetprograms have fulfilled the state requirements to be considered active and eligible for benefits.The primary benefits are the opportunity to apply for funding through the state procurement system,apply for registration scholarships to attend Main Street, Historic Preservation and other approvedconferences plus engage in conference calls and meetings to network with other Main Street communities. 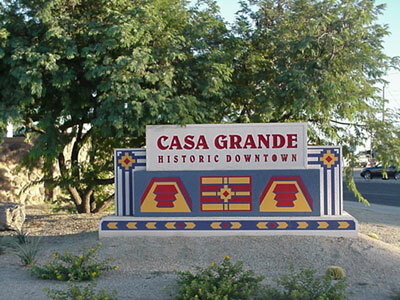 Casa Grande Main Street was accepted as an Arizona Main Street community in September 1992.Currently, there is a volunteer board of directors and four committees. Our committees arestructured under the four-point approach of Design, Economic Restructuring, Organization andPromotion. . Main Street is overseen by a Board of Directors and managed by the ExecutiveDirector. There is an active membership along with a supportive volunteer base, which help executea wide range of projects and programs. Staff: Since the inception of the program, there have been 4 directors. The first Executive Director was in the position for six years. There was one year without a director. The second Executive Director was in the position for three months during the summer of 1999. The third Director was in the position for 7.5 years and left in May 2008. The current Executive Director has been in the position since August 2008. A part –time administrative assistant is hired between October 1 and April 30th to help with theHistoric Downtown Casa Grande Street Fair and Car Show, which happens in mid January every year. Contract labor is hired as needed for other specific projects.